Time to fire up the wayback machine and go even further back into the paleolithic (before they even had television!) 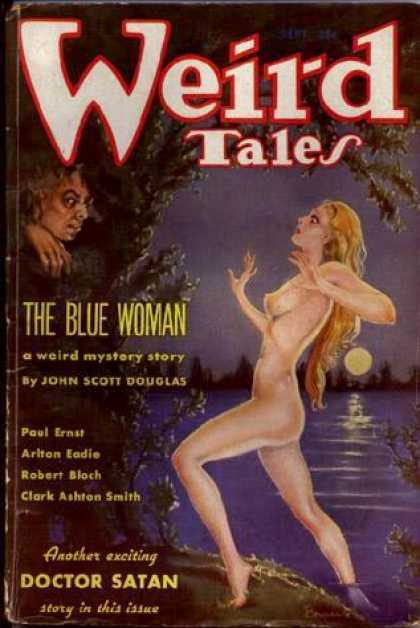 and take a look at what may not have been the best magazine ever, but is my all-time favorite, WEIRD TALES. Yes, there was a lot of flotsam and jetsam in there (especially in the early issues) but they hit their stride in the late 1920s with the great WT Triumvirate of Robert E. Howard/Clark Ashton Smith/H. P. Lovecraft. Three great writers. Three utterly unique voices. Oft imitated, never equaled. Throw in C. L. Moore, and you have a quartet. In the second tier there was Seabury Quinn (the most consistently popular writer in their monthly polls), Frank Belknap Long, Henry Kuttner, and Robert Bloch, who all (most of the time, anyway) could bat clean-up for most any other team. And to illustrate their bizarre and phantasmagorical tales, there was the Queen of Weird Tales, Margaret Brundage. Much like REH/CAS/HPL, there has never been anyone like Margaret Brundage. The closest to my mind is Virgil Finlay, certainly a great artist in his own right, but Brundage was unique. She imbued her paintings with a smouldering sensuality never seen before on the magazine racks, and which since has only been equaled by a very few, and never surpassed. What’s amazing is that she accomplished her artistic triumphs in an age of near-Victorian prudishness. Margaret Brundage painted 66 covers for Weird Tales, and many commentators have said that these covers were as responsible for Weird Tales success as the stories they illustrated. I’d like to post all of them, but I’ll settle for putting up a few because one just ain’t enough. Special plug: The good folks at Girasol Collectibles have done the collecting/reading world a great favor by producing a number of facsimile editions of many early issues of Weird Tales at very reasonable prices. If you, like me, have ever dreamed of owning these magazines, but are unable to afford the prices of hundreds to thousands of dollars an issue they bring, you should head right over to their website and buy a half dozen. Moreover, you can actually READ these copies without worrying about eighty or ninety year old pulp magazines disintegrating in your hands as you turn a page. My great thanks to Girasol Collectibles for making these genuine treasures available for future generations of readers to venerate.